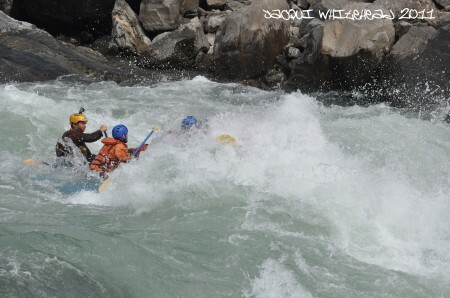 Many peoples initial impression when you tell them about whitewater rafting in the Nepal is that it will be really cold! Not so. The Sun Kosi rafting holiday, offers warm whitewater rafting many hundreds of kilometers after it tumbles off the Himalayan peaks. This 270 km 10 day journey is best to tackle after the heavy monsoon rains have stopped and returned the huge beaches again to pristine condition. The drive to the start of the trip near Dolalghat offers stunning Himalayan vistas, something we don’t see again until the spectacular flight back to Kathmandu. The upper Sun Kosi has become more developed over the years with roads being put in, a bungy jump site, however the lower reaches of the Sun Kosi still provide a wonderful escape through the aptly named jungle corridor. Rapids you’ll raft on the Sun Kosi include High Anxiety, Jaws, Rhino Rock, Big Dipper and Harkapur. Rapids vary in length and grade, but offer a wonderful challenge to even the most experienced rafter. The trip can easily be extended with a trip into the nearby Chitwan National Park for an opportunity to see rhino, elephants, mugger crocodiles and the elusive tiger. A raft trip on the Sun Kosi emerges on the Indian Terai, the flatlands leading into India as the Sun Kosi continues down to the Ganga or Ganges River.